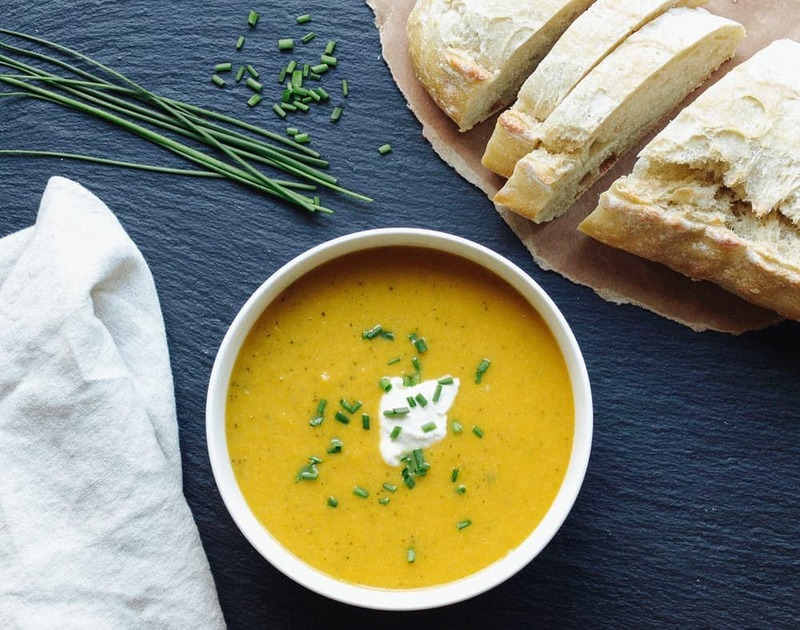 This Zucchini & Sweet Potato Vichyssoise was such a beautiful and easy soup to make. It’s so basic, yet packs tons of flavor. 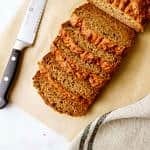 Simple and delicious, it’s a welcome addition to the recipe collection! 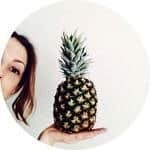 Traditionally Vichyssoise is made with regular potatoes, but once I starting researching for this recipe I came across a few recipes using sweet potatoes and that was that! This recipe is largely adapted from Ina Garten. Vichyssoise, pronounced vish-e-swaz, is traditionally served chilled but I found this to be amazing warmed or at room temp. Every time I’ve made this it has been gone before it could ever be refrigerated. I encourage you to enjoy this soup however you prefer. 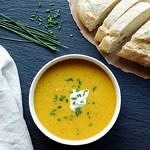 It’s lovely with a slice of toasted crusty bread for dipping and a nice glass of lemon water. To add protein and texture, try topping your soup with these Chipotle Roasted Chickpeas or Curry & Sriracha Roasted Chickpeas overtop, both would be great! Sweet potatoes with its bright orange flesh, some varieties have purple, are highly nutritious, full of anti-oxidants, vitamins A & C and trace minerals. 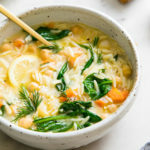 They fit in perfectly with the other ingredients while giving this soup a warm golden color. 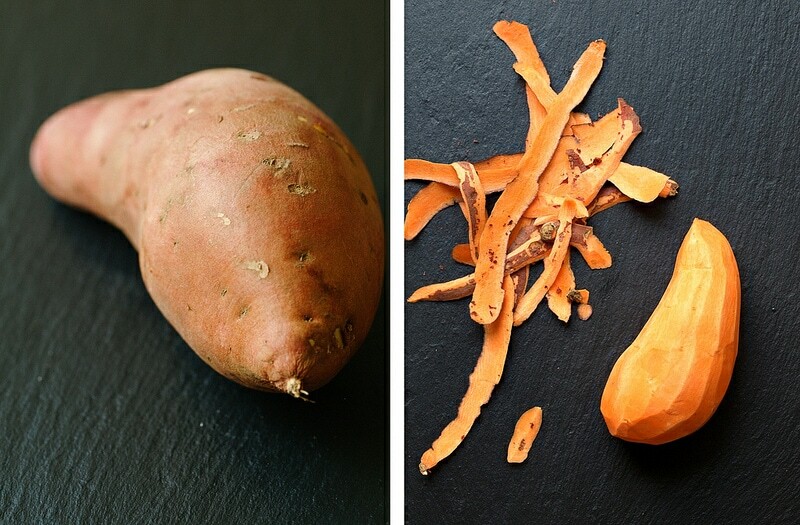 You can either peel your sweet potatoes or leave the peel on for added fiber. 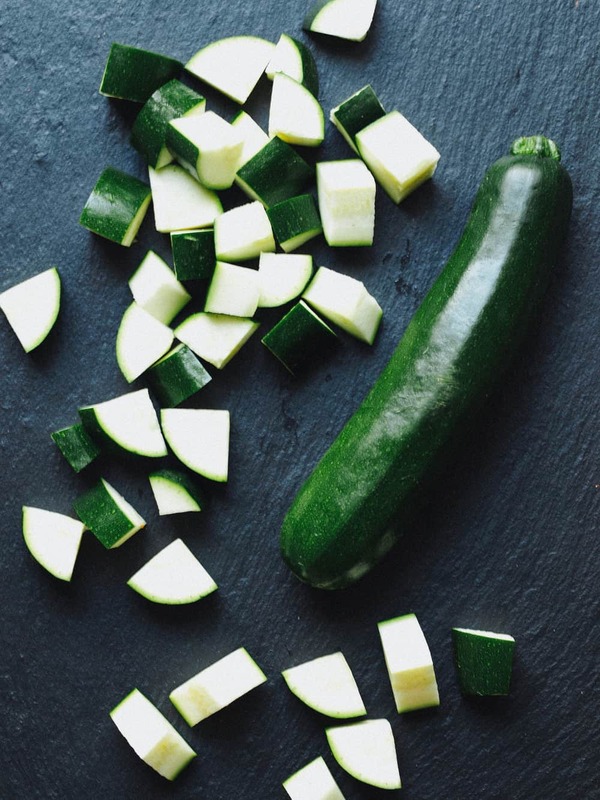 Zucchini is a vegetable found year round here in California and I hope you find it just as easily wherever you’re located. It’s an easy and nutritious addition to the soup. I love leeks with their mellow onion flavor and will use them wherever I can. 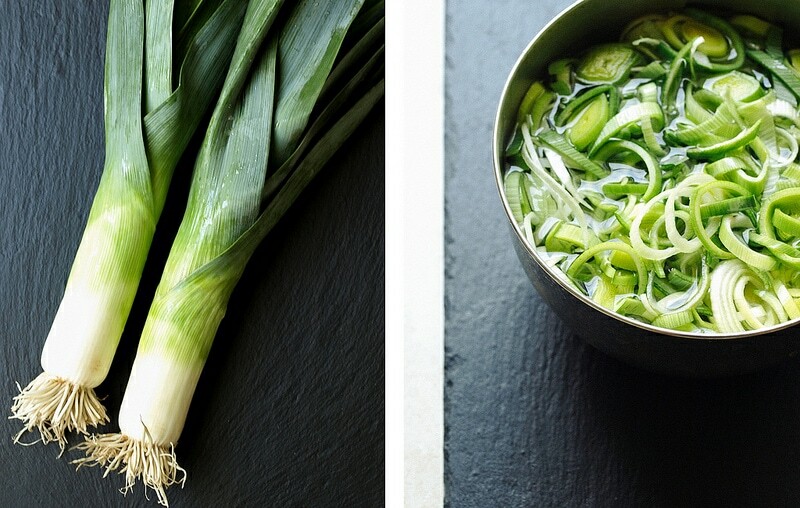 Leeks are also highly beneficial to the human body and should be enjoyed often. They do tend to trap dirt in their stalks so be sure to rinse well after slicing removing any debris. Place them in a bowl of cool water, swish them around separating the rings and rinsing well. Or simply use cool running water and a colander. Cups and cups, and cups of simple ingredients to be made into a soup you can enjoy warm or chilled. At this point, your leeks are cooked down, the remaining ingredients have been added to the pot and you’re ready to simmer. 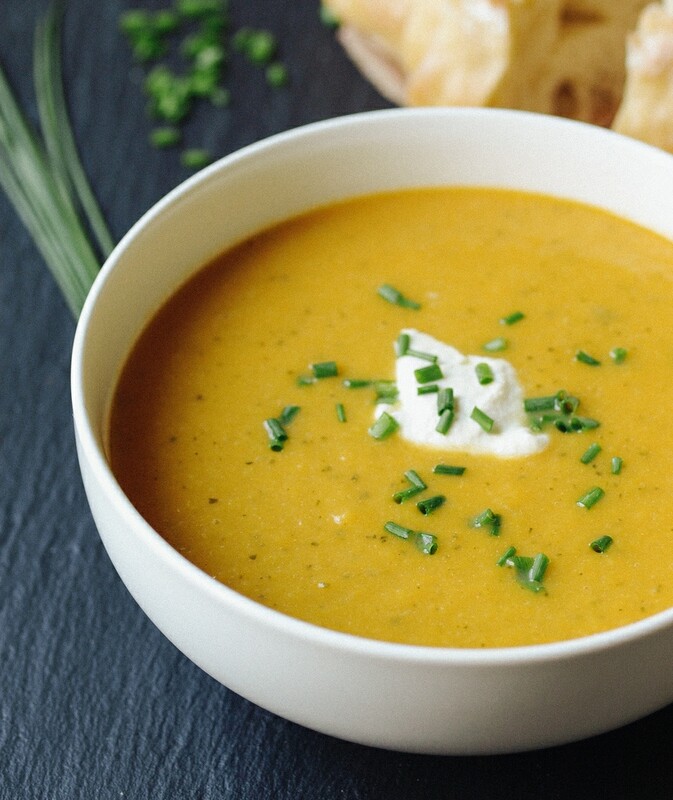 Once complete you’ll have yourself a comforting, velvety soup that’s packed full of nutrition and a home that smells divine! This would be great with spiralized or julienned zucchini noodles. For some spiciness, try adding a sprinkle of ground cayenne or chipotle powder when serving. 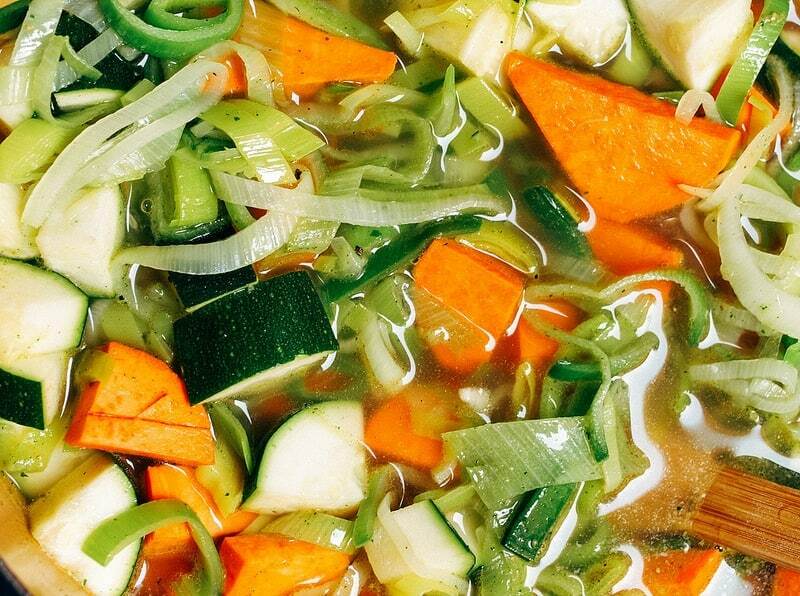 Zucchini and sweet potato are the base of this minimal soup. 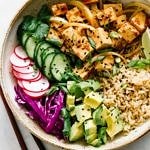 It’s easy, healthy and delicious! 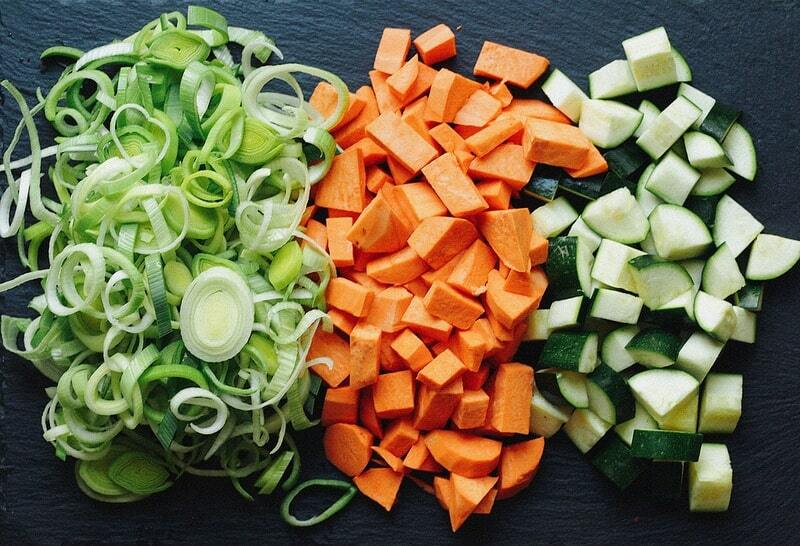 Chop and prepare your vegetables. For the leeks, once sliced place them in a bowl of cool water swishing them around to rinse away any dirt that is trapped, drain in a colander giving another good rinse, or simply use a colander making sure to break up the rings releasing any dirt in between. The sweet potatoes can either be peeled or left unpeeled. In a large dutch oven or stock pot, heat oil over medium, add leeks and saute until softened, about five minutes. Add the sweet potatoes, zucchini, vegetable broth, salt, pepper and optional turmeric, bring to a boil, reduce heat to low, cover and simmer for 30 minutes. Let cool about 10 – 15 minutes. Using a hand held submersion blender, blend until creamy. Add the cream and blend again. Or you may opt to use a blender or food processor to blend your soup (this will most likely take two batches to complete). Serve hot or chilled (I especially liked this warm or at room temp). Feel free to add in some unsweetened non-dairy milk if your soup is super thick, about 1/4 – 1/2 cup. This soup is wonderful on its own without the optional turmeric or curry powder. I have them here in case you would like to vary the recipe up from time to time. Turmeric is noted for it’s ability as an anti-inflammatory and cancer inhibitor, adding to the soup will enhance the nutritional profile. As for the curry, if you love it, it will also complement the soup nicely! This would be great with some spiralized or julienned zucchini noodles. For added protein and texture, try topping your soup with these Chipotle Roasted Chickpeas or Curry & Sriracha Roasted Chickpeas overtop, both are great! 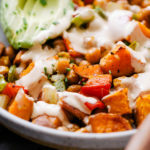 If you’re not a fan of sweet potatoes, sub in regular potatoes instead.